Are newspaper reading habits changing? The answer to the question: "Are newspaper reading habits changing? ", is yes. The nature of the modern publication has changed dramatically over a span of very few years. This change has not only been limited to the publication. Consumer and reader behavior change at an equally high pace, which emphasizes the need for quick reactions and general responsiveness in the industry. One of the more interesting changes concerning modern publications has been the advent of the evening publication. Traditionally, newspapers have been distributed on the same morning as the publication is published. When the publication product became both a physical and a digital product, the possibilities regarding release times were affected. Now, media houses have the opportunity to consider an early digital release. The publication product is usually finished during the evening and then sent to the press. This is the point where the publication is distributed to the digital solutions as well. 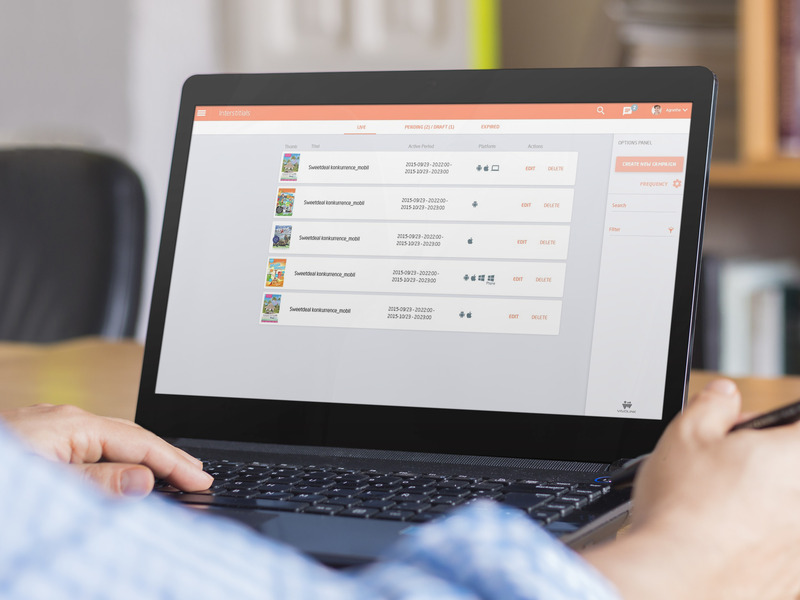 By intercepting it at this point in the distribution chain, the digital product is able to be sent to the readers immediately after the publication is finished, creating a whole new perspective in the media industry. Several media houses have embraced the broadened possibilities and launched their publication in the evening on their digital platforms. Even though the majority of media houses still refrain from using this strategy, it has been around long enough to assess whether the reading patterns of the average reader has been influenced. 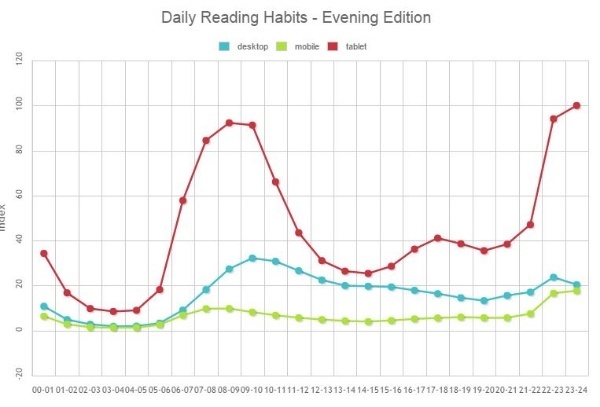 The first graph shows the reading patterns for the publications without an evening edition. After the initial peak hours from 8 to 10, the number of openings on mobile and desktop gradually decrease throughout the day. However, the evolution in tablet openings is different from the other devices. 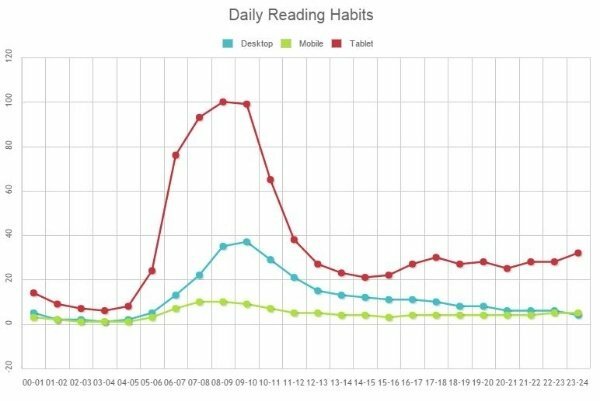 The number of openings grows from around the afternoon until midnight, which indicates the readers preference for reading publications on their tablet in the evening. Additionally, the tablet is the preferred device to read the publication. Publications with an evening edition show a significantly different pattern in the reading behavior. While desktop and mobile keep the same pattern, the story is another for tablet. The peak hours are no longer during the morning but has moved to the evening, where the index shows the highest amount of publication openings for any device by far. The launch of the evening publications have contributed to a considerably different reading pattern, which clearly dispenses the traditional perception of the morning as the primary news period. When offered the opportunity, readers are more likely to open the publications during the evening release. It has become a priority on the media houses agenda’s and can become an important element in a digital strategy to secure future profits for media houses during times of change. What does the future hold for digital publishing? The changing habits emphasize a successful decision from the media houses’ perspective. The evening edition resembles an extra opportunity for the reader, but does not necessarily force any change of habits. Hence, the voluntary change from the readers perspective proves the evening edition has unveiled a previously unseen opportunity for evening news consumption in the form of a publication. To keep up with the change and remain proactive in the rapidly changing media industry, media houses must be sure to respond to the trends seen in the data. By doing so, they can assert their position in the market and continue to deliver the highest quality news at the right time to the readers. You can read more about ePaper reader behavior in our latest Benchmark Report. The data has been collected from large european media houses between 01/01/2015 and 10/03/2015.